Among the pieces in my textile collection are two hand-printed ajrakh fabrics, from Sind Province in Pakistan, that fill me with particular admiration for the dyer’s skill. So I thought I’d write a little about this fascinating dyeing technique. 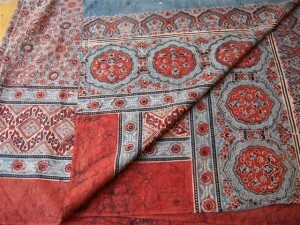 Ajrakh cloth may be broadly defined as a cotton fabric patterned on one or both sides by means of printing blocks. The background colour is either red or blue and the pattern designs are usually encompassed within square repeats or bound by rectangular ones, with geometrical motifs and circular forms. These cloths are produced on the Indian sub-continent in Sind, Gujarat and Western Rajasthan and represent a high point in dyeing techniques, requiring extreme skill not only on the part of the dyers but also from the craftsmen who carve the wooden printing blocks. Ajrakh cloths are worn mainly by Muslim men, as head coverings, shoulder cloths, lungis (lower garments) or as knee supporters when squatting on the ground. Each piece of cloth is of a set dimension according to its intended use. Sizes vary from 1m x 1m to 2.56m x 1.85m. For the largest pieces, two single widths are joined lengthwise. Several dyeing methods come together in the making of these cloths: mordant printing, resist printing (or combinations of the two), the tannin/iron complex for dyeing black, indigo vat dyeing and madder dyeing. The finest ajrakh fabrics are resisted, printed and dyed on both sides of the cloth, with such skill that each side is identical. 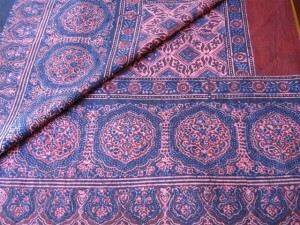 In the past, ajrakh cloths were dyed using natural madder and indigo dyes. Madder red is obtained from several plant sources on the Indian sub-continent, including Rubia tinctorum, Rubia cordifolia, Rubia munjista, Morinda citrifolia and Oldenlandia umbellata (chay), which all contain the red pigment alizarin. Nowadays, synthetic alizarin is widely used. Similarly, natural indigo blue from Indigofera tinctoria has been largely replaced by synthetic indigo. However, in some areas there is a gradual return to natural dyes. In addition to the madder and indigo dyes, metallic salts of aluminium and iron are also used and it is pastes of these which are printed onto the fabric, not the dye colour itself. These pastes act as both resists and mordants. The mordant penetrates the fabric, whilst the gum and clay, with which the solution is thickened, protect the fabric from unwanted dye. These pastes are applied to both sides of the cloth, unless only one side is to be patterned. The cloth is first washed and beaten with a wooden mallet to smooth the surface and remove any irregularities. It is then dried. Next, the cloth is treated in buffalo milk or a castor oil and sodium carbonate solution, to which water is added. This treatment aids the absorption of mordant and dye and also prevents the mordant salts from crystallizing. Fresh camel, goat or sheep dung, mixed with water, may also be added to the solution and this acts as a bleaching agent. The cloth is then dried overnight and washed the following day. The next stage involves the application of a tannin solution, usually made from the dried fruits of myrobalan (Terminalia chebula), pounded with water to form a paste then mixed with more water. The wetted cloth is soaked in this solution. The tannin acts as an assistant for the alum mordant and also reacts with the iron mordant to produce black outlines. Before the cloth is dyed in the indigo vat, all areas not to be dyed blue have to be covered by printing on the appropriate paste solution, using carved wooden blocks. The printing processes are carried out on a wooden bench, covered with 15 to 20 layers of jute, topped by thick cotton fabric, which provides a soft, absorbent work surface. An iron print solution, usually iron acetate or a ferrous sulphate solution mixed with gum arabic or sorghum and mud or clay, is applied to the areas to be dyed black. An alum print solution, usually aluminium sulphate mixed with gum arabic or sorghum and mud or clay, is applied to the areas to be dyed red. 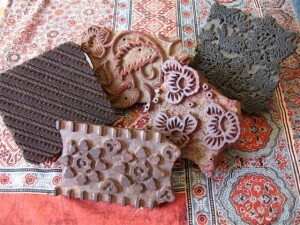 Sometimes red clay, which gives a fugitive colour, is also added to distinguish it from the iron solution. If some areas of deeper red are required, extra quantities of alum solution are applied to those sections. Alternatively, these sections may receive a second application of alum paste. Any areas to remain undyed are printed with a paste of gum arabic and mud or clay, sometimes with the addition of lime to ensure the resist paste does not crack. If both sides are to be identically patterned, the second side is printed before the pastes on the first side have dried completely and while they still remain damp. This ensures uniformity of the printed impressions, as the printed sections of the cloth contract when dry and the fabric would no longer remain flat enough to enable the second side to be printed successfully. The printed areas are then sprinkled with powdered clay or dung and dried in sunlight for up to two days. Indigo is the first dye to be applied and the fabric is carefully immersed in the indigo vat, then removed to allow the indigo to oxidise. It is important that the cloth does not remain too long in the vat, otherwise the pastes may begin to soften and the designs would be impaired. Sometimes two depths of indigo blue may be required. In this case, after the first indigo dyeing process has been completed, the sections to remain at the level of blue achieved from this first immersion are printed with the resist paste, sprinkled with powdered clay or dung and the cloth is then dried. After drying, the cloth is dipped again in the vat, resulting in a deeper blue on the unresisted areas. After oxidisation, the cloth is washed and de-gummed whilst it is still wet and for this the cloth is held under running water, which gently loosens the pastes. This process has to be carried out with great care, to ensure the mordant pastes do not smear, as this would adversely affect the clarity of the designs when dyed. The next stage is the application of the red madder or alizarin dye. The de-gummed cloth is immersed in the dye solution and simmered for up to two hours. It is then removed and washed before being dried in bright sunlight, which helps to remove any red dye which may have fugitively coloured the indigo-dyed areas or the paste-resisted sections intended to remain undyed. At the same time, the sunlight brightens the madder or alizarin dyed areas which received the alum and iron mordant pastes. 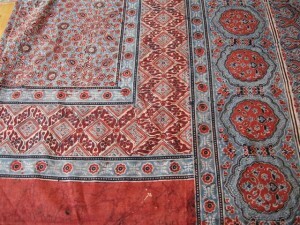 The finished cloth is patterned in blue and red, with black outlines to some designs and some undyed areas, which sometimes tend to be beige as a result of the treatment in the tannin solution. This shows the other ajrakh cloth from my collection, also patterned identically on each side. So simple and yet so complex! This floor rug for my granddaughter was made from old white woollen blankets. My preference for making full use of whatever is available, rather than buying something new, is a characteristic my children find rather irritating at times. My frugality in the kitchen is also often the cause of much mockery, especially when I insist on diluting all dishwashing liquids at the rate of 1 part dishwashing liquid to 3 parts water and on using each teabag for at least two cups of tea and even three, if at all possible. However, occasionally they reluctantly agree that waste materials can sometimes be put to good uses. When I told my daughter that I was making a floor rug for Milly from old woollen blankets, she was less than enthusiastic. But I continued nevertheless. The woollen blanket pieces were mordanted in alum, then dyed using cochineal, madder, weld and indigo. I then used the Log Cabin patchwork technique to piece the strips together. I really love this particular patchwork method, as it seems ideally suited to impatient people like me, especially as it can be easily done on the sewing-machine. 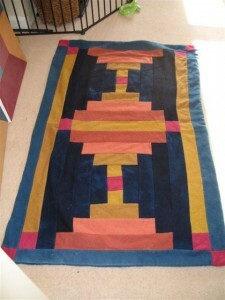 The backing for the rug was a single piece of woollen blanket, dyed in indigo, and the rug and its backing were placed with the right sides together and then machine-sewn round three sides. The rug was then turned right-side out and the last seam was stitched by hand. Another advantage of this rug is that it can be machine-washed without risk of shrinking, as any shrinking will have taken place during the simmering of the mordanting and dyeing processes, making it unlikely to shrink further. Indeed, this rug has already successfully withstood several machine washes. And my daughter and granddaughter love it, so I feel my efforts were worth while. 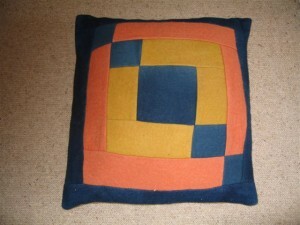 I also made a large floor cushion, using the same techniques.